Particle accelerators are a key element in many of today’s cutting-edge research areas, including fundamental scientific research or applied disciplines such as materials science or medicine. Particle acceleration requires cavity resonators that are driven with high RF powers at defined frequencies. Rohde & Schwarz offers RF solid-state amplifiers for frequencies ranging from 9 kHz to 6 GHz, delivering CW power up to 100 kW and more. With the constant need for even higher beam energy, safety requirements become increasingly important and challenging. Even a marginal loss of beam into any part of the accelerator will cause damage, resulting in costly repairs and weeks of downtime. The R&S®RTO provides an ultra-fast mask test and is the ideal tool for such safety interlock systems. With the latest-generation of free electron lasers (FEL) the rate of macro-bunches inside the accelerator can be increased to 100 Hz. 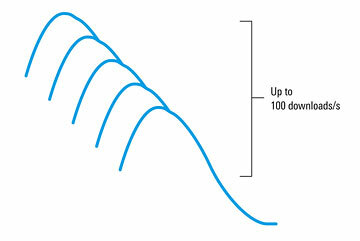 The R&S®RTO is the ideal tool for Continuous Beam Quality Monitoring and allows waveform acquisition and download to a PC at rates of 100 Hz. Synchronization inside the accelerator is key for many experiments. One example is the alignment of laser pulse and synchrotron source based on a precise delay measurement. 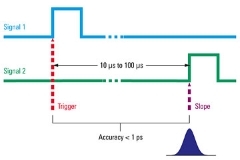 Minimizing the trigger jitter is crucial for accurate results.The precise digital trigger of the R&S®RTO in combination with the OCXO option allow measurements to reach sub-picosecond accuracy. When running, maintaining and conducting scientific experiments a reliable communication is the key to scientific success – but also a major contribution to personal safety in harsh environments of a particle accelerator. 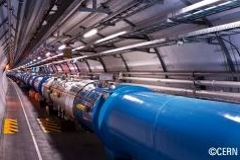 Rohde & Schwarz subsidiary SwissQual has successfully deployed a network monitoring system that ensures seamless communication of engineers and scientists at CERN even 100 meters underground. 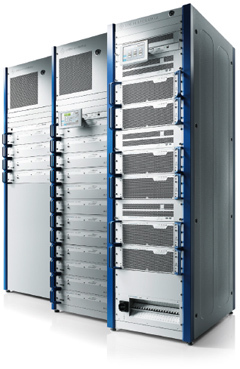 The R&S®THU9 UHF amplifier solution with 100kW RF output and more: featuring state of the art efficiency from the TV transmitter market leader.